The wasteland is a dangerous place! I have great memories of the old Fallout 1 and 2 computer games; like all old games they look very dated now, but at the time they were vivid and strange post-apocalytic worlds full of interesting characters and exciting adventure. 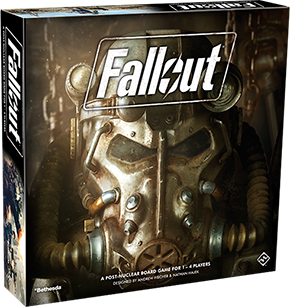 The later 3D versions have lost a bit of that charm and I haven’t found them as engaging, but I was excited to see a boardgame version of Fallout suddenly appear. FFG do so many expansions and Star Wars games these days, it’s good to see them come out with something new now and again. And on the whole, the new game doesn’t disappoint. I’ve only played it once and found it enjoyable, though I do think the agenda cards you gather to get game-winning ‘influence’ can seem a bit arbitrary: If there’s one thing I dislike in a game is the anticlimax of someone revealing their secret cards and saying “I won!” when no one had any idea they were about to win. The large deck of quest cards works very well however, and most of the time the story progresses believably and satisfyingly. There are four scenarios, so perhaps replayablity is slightly limited; but no doubt expansions will appear at a later date. It’s a relatively straightforward addition to the adventure game genre and there’s nothing hugely revolutionary going on, but it does capture a bit of that unique Fallout atmosphere. Already printed and laminated, thanks EOG. Much better than trying to decipher two, subtly different, reference guide and learn-to-play guide. Even though the game ccomes with only four scenarios, combined with a) the randomised nature of the board, b) lots of sub-quests (Choose Your Own Adventure style) and c) sub-plots impacted by interactions with particular characters, there’s a fair amount of variation from replayability. After playing a couple of games, I would recommend house-ruling the agenda mechanics though. eg Every time a player can pick up an agenda card (including the start), the player takes two cards and keeps one, discarding the other back into the deck. This gives the players some agency in deciding which faction to support. Also, binning the ‘Faction Win’ which I don’t think adds anything to player satisfaction. BoardGameGeek has lively discussions on house variants. That’s a great little tip, and brings a little choice back into that procedure. FFG aren’t averse to ‘fixing’ things in expansions (eg Star Wars: Rebellion combat), so who knows, they may tweak that particular mechanic – or expand on it – if there is an expansion. I love this game, and think it captures the feel of the RPG very well. I’m surprised there’s no expansions yet, but hope there are some forthcoming. New games seem so rare at FFG these days, it’s just a constant stream of expansions! I hope this one gets some more love too, though really there’s plenty here to keep me happy for a long time considering how often it gets to the table. Good to see more, though I was hoping for some tweaks to the scoring system.